You can use a volume snapshot of a virtual machine rootdisk to create a new template, which is stored in your VDC account for use in creating new VMs. You can use this feature to create customised templates (based on the templates provided by Interoute, or your own uploaded templates), which have been configured to your own specific requirements. 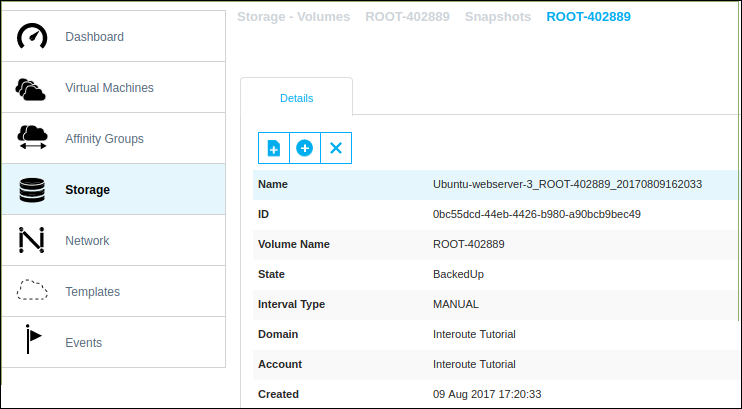 First, you will need to create a volume snapshot from the rootdisk of the VM that you want to use as the basis for your new template. See How to take a snapshot of a volume. Note: You can also upload ('register') new templates into VDC from external sources. 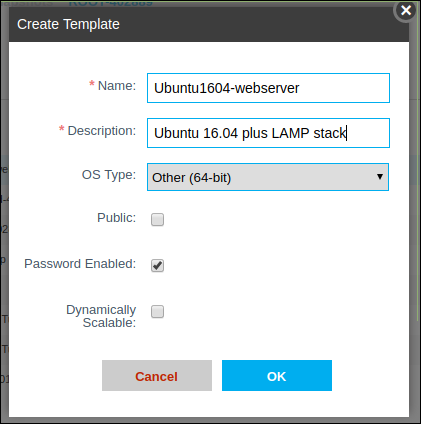 See How to upload a template to your VDC. You may store a maximum of 20 created or uploaded templates in a VDC account (this number can be changed on request). The storage space occupied by the templates is charged for at all times. Alternatively, you can directly see a list of all the snapshots in your VDC account by clicking Storage in the left-hand menu, then use the Select view dropdown to select Snapshots. A Name and Description are required. Set the OS Type to be the same as the 'OS type' of the source virtual machine (use the Details view of the virtual machine). Use 'Other' if the OS type is not listed. Setting the OS Type provides some optimisation for deployed VMs based on this template. Optional settings: Password Enabled: If you would like to be able to reset the administrator/root password of your VM from within the VDC Control Centre, you must install appropriate software into your original VM before creating a snapshot, and tick this option box to flag that password reset is possible (all templates provided by Interoute have the 'Password Enabled' feature configured). Dynamically Scalable: If your template contains software so that a VM can dynamically adjust its number of CPUs and RAM (that is, without need to stop the VM) then tick this option box to flag that dynamic scaling is possible (all of the standard Windows and Linux templates provided by Interoute have the 'dynamically scalable' function enabled). Click OK. The creation process will start and may take several minutes to complete. The user interface may be locked with a 'busy' icon. The new template will appear in the list of your owned templates in the Templates panel (click in the menu on the left-hand side). Make sure the Filter by drop-down is set to Mine. Click the name of the new template ('Ubuntu1604-webserver') to see its details, and the Zones tab will show that it exists in the same zone as the source snapshot (and the source VM). Click the zone name to show additional template details. In particular, check that the 'Ready' parameter is set to 'Yes', and thus the template is usable to deploy new VMs. 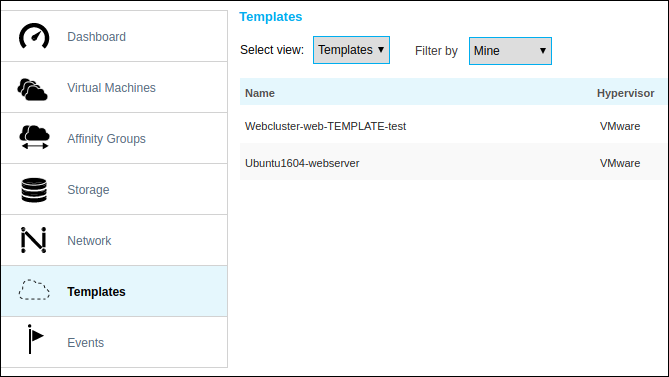 Your created template can be used in the same way as any of the standard templates to deploy a VM. The template must exist in the zone where you wish to deploy a VM. If it does not, you will need to copy the template from its original zone (see below). At the template selection step of the Add Virtual Machine procedure (see How to create a virtual machine), click the My templates tab to see the list of your own created (or uploaded) templates. The VDC Control Centre organises templates into different categories, which are viewed separately using the Filter by drop-down. All of the templates uploaded or created by you will be located in the Mine category. For templates that are owned by you, it is possible to delete them. Note that deletion is immediate and there is no recovery backup. When a template does not exist in a zone where it is needed, click on the zone name of a current location (or, choose any zone name if there is more than one) and use the Copy Template button to make a copy in a new zone. Note: the copies are independent of each other, so you only need to store copies in the zones where they are being used.